India is a land of diversity and being a home to such diverse cultures also attracts a lot of myths. Since my childhood I have been told a lot of things with respect to food items and how they have an impact on our body. For me, things that have been told and passed since ages doesn't mean they are always right. 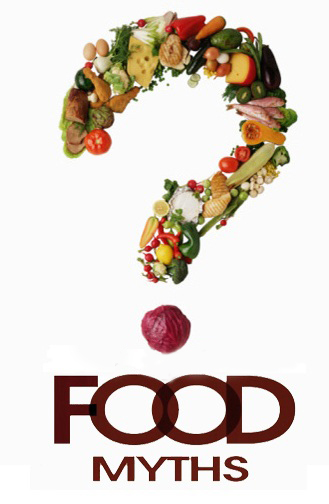 Hence I am writing this article on common food myths which are still revolving in our society. Avoid Dairy Products During Cold: Often my parents used to advise not to consume dairy products when I used to have cold. The reason was consumption of such products led to formation of mucus. However, this myth is false and one can have dairy products at the right temperature even during cold. Drinking Tea Darkens Your Complexion: I am sure this was one of the most common saying from our elders. But this is absolutely false and it has no relation to our skin's complexion. Avoid Having Milk after Eating Papaya and Vice Versa: Again the question comes 'is there any reaction that develops once they both are consumed at the same time'? I have seen papaya shakes being sold and that is a combination of milk and papaya. Unless any of these food items are contaminated, I see no reason why they can't be consumed together. Having Coconut or Saffron during Pregnancy makes the Baby Fair: The skin tone of the baby is determined by the parents genes. Consuming any food product will not have any impact on the colour of the baby. Consumption of Lots of Carrots will make your Vision Better: This myth is false as lots of carrots will prevent from Vitamin A deficiency and reduce the chances of night blindness. They will not make the eyesight any better. Brown Sugar is better than White Sugar: Both brown and white sugar provides same amount of energy. The only difference is brown sugar contains molasses and has a caramel aroma around it while white sugar is refined to remove molasses. Eating less Sugar Prevents from Diabetes: Diabetes arises as a result of genetic (history of diabetes in family) and lifestyle factors (such as high calorie diets or physical inactivity). Consumption of less sugar will save few calories but can not protect from diabetes. Since it is a disorder of carbohydrate metabolism, one should have a balance of carbs, fats and proteins in order to maintain healthy blood glucose levels in the body. Eating late at night causes Weight Gain: The weight of your body depends on the intake and outgo of calories. It does not make any difference to the body weight at what time you are having food. The above were some of the myths that I identified. I am sure there are still a lot and if you are aware of any do mention in the comments section.